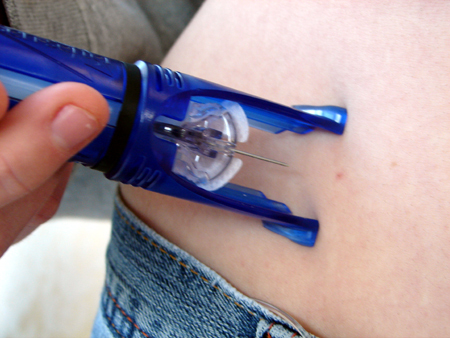 The initial viewing of this needle scared me, but the actual insertion is less painful than pump insertion. This one has been a long time coming. I have had a continuous glucose monitor for months now and I have not yet written anything about it. This one will not be interesting to any of my non-diabetic friends, and will probably be free of any crazy humor so feel free to scroll down and locate a different post. Perhaps a “Cat by Any Other Name.” Good day, and thanks for stopping by. Now, back to the continuous glucose monitor (CGM)…. I had many struggles with this little rascal and I’m hoping this post might help a fellow type 1 diabetic comrade find answers to their questions. I’m going on the assumption that whomever reads this knows the basic workings and terminology that goes with the CGM. I went into this thinking the CGM was going to be this amazing magical thing that solved all the problems of the universe. I was wrong. While, it was and is an amazing, magical thing it definitely has its fair share of tribulations… at least for me. Everyone is different. The first time I got it inserted I was looking at my pump in wonder waiting for the initial two hours to pass so I could enter my blood sugar, get it calibrated and get this party started. Imagine my horror when my pump screen kept popping up with “Weak Signal” and pushing my calibration time back and back. “Is this normal?” “Son of a bee sting.” “What do I do now?” “Why is this happening?” “Did I forget to lock up my house this morning?” are some of the thoughts running through my head at this time. At one point, I got it working and it spit out a few testings for 20 min then it went back to “Weak Signal” screen and the dreaded “Warm-up.” Now, mind you, this was my first day on the job, so to speak, I had no clue really what I was doing and what would become normal glitches in the process and what was uncommon and should be fixed. In this instance it turned out that I had one of two possible problems. Either I had put it in a bad spot that had scar tissue underneath my skin due to 10 years on the pump or the CGM was “pistoning” out of my interstitial fluids (most likely). I’d like to tell you I figured this all out right off the bat, but it took me months to nail down a more accurate process. What happened was I got discouraged and gave up on it then I would go back to it later have a good use of it and on the next insertion it be back to the same darn isues. This went off and on until I gave in and decided to call MiniMed and speak to an extremely helpful fellow. Don’t be stubborn like me and try to figure it out on your own. Call the hotline, it’s what they are there for and everyone I have spoken with at MiniMed over the years has seemed like they legitimately care about getting you on the right path. That’s not always the case when it comes to customer service reps these days…like Mediacom…very rude reps… but that’s another story and nothing to do with diabetes. My solution to getting my CGM working was to place it in better spots on my stomach and to use two taping methods on sticking the little sucker to me. When everything is hooked in I use a piece of Nexcare Durable cloth tape tightly over the sensor portion of the CGM, then I place a separate piece over the transmitter. After that I use IV prep 3000 that came with my CGM and place it over the whole thing. Taping it up like this helps to prevent the “pistoning” thing to happen. I’m still in taping testing phases. I’ve run out of the IV Prep 3000 so next time I’m going to use Nexcare Tegaderm…it looks similar to the IV Prep so I shall see what happens. Tonight marks another “low blood sugar at the grocery store” moment. As I’ve previously mentioned, being in a store when you have a low blood sugar is pure madness. You never know what will end up in your cart. You may go in for a gallon of milk, but walk out with a parakeet instead. REASON FOR GOING: Nail Polish Remover. And last… the most disgusting sounding thing ever and something I’m pretty sure will end up in the breakroom at work tomorrow. 13. Lays “Spicy Ketchup” Potato Chips. I feel sick to my stomach just thinking about it!